This House of Blessing, Beit Bracha in Hebrew, ministers peace to followers of Jesus from all over the globe. Our guests come to experience the region of Israel where Jesus proclaimed His kingdom and began the ministry that has been transforming the world for more than 2000 years. Beit Bracha is a bed and breakfast, with en-suite accommodation for up to 30 people and is ideally suited for larger group bookings, and tour groups (whether from our own Shoresh Tours, or other tour groups). 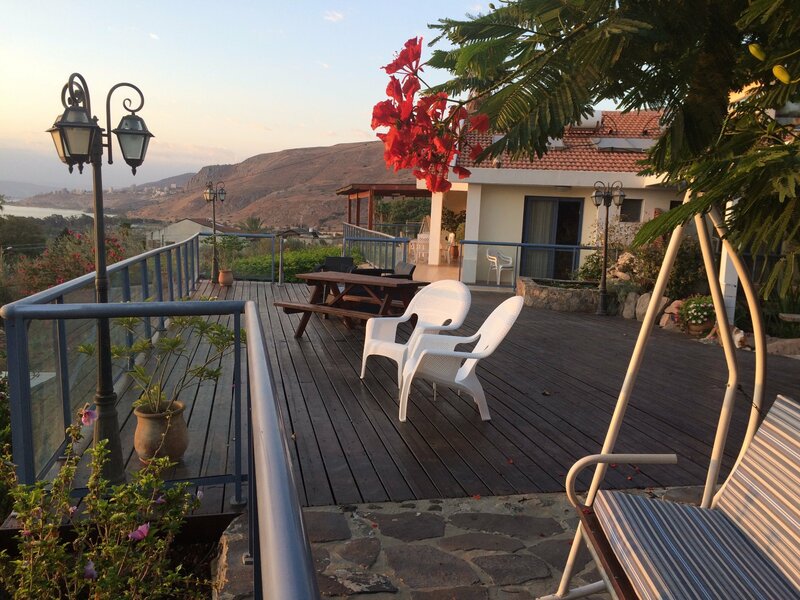 Sunrise over the Golan Heights welcomes our guests to an Israeli breakfast enjoyed family-style in the main house. All guests are welcome to join our staff after breakfast for prayer and Bible study. We also have a wonderful Bedouin prayer tent in our carefully manicured gardens, which can be reserved for group and / or personal prayer in the shadow of our old olive trees from which we still harvest and press our own olive oil. Comfortable accommodation includes 12 rooms - 6 on either side of a light-filled, airy lounge area. The lounge features a CMJ Heritage Centre display testifying to the Gentile contribution to the development of the Galilee and restoration of Israel. A lending library and comfortable seating invite you to step back in time as you enjoy history and photographs from the CMJ archives telling stories of the Galilee from 1870 until 1930. A self-service water, tea and coffee bar in the hall offers you complimentary drinks throughout your stay, and WiFi is freely available. The hall opens onto a covered terrace facing the Sea of Galilee, with views of Tiberias toward the south, the Golan Heights due east, and the ancient town of Safed (Tzefat) to the North. The terrace extends to an expansive deck featuring a pergola, fountain with Koi pond, and swing, all framed by lush flowers and foliage. From here you enter the main house where you’ll join our staff and other guests for breakfast at 8 am Sunday-Friday, or amble in at your leisure on Saturday from 8:30-9:30 am. Pre-booked evening meals are available Monday, Wednesday, and Friday nights at 6 pm (October-April) and 6:30 pm (May-September). Click here to visit our image gallery, and here for our room rates. Our Guest House features a lower level multi-purpose room, and is available to rent for groups desiring conference space or a place to relax. Amenities include a video projector and screen, ping pong table, and board games. Our prayer is that all who come will encounter the person and presence of Jesus the Messiah, who continues to transform lives, here in the Galilee where it all began. We hope to welcome you soon to Beit Bracha - a House of Blessing! God's promise to Israel: For I know the plans I have for you,’ declares the Lord, ‘plans to prosper you and not to harm you, plans to give you hope and a future.